I maintain this site as a means of easily sharing information about my scholarship, teaching, and research interests with colleagues, students, friends, and others. If you are seeking specific information not found here, please try reaching me via email. I thank you for taking the time to discover more about my intellectual passions. My Teaching Portfolio is an interactive Adobe document with embedded links. I hope that you enjoy reading my Teaching Portfolio! Please email me with questions. All materials in my portfolio and on these pages are copyrighted. I hopped over to Wordle.net to create Word Clouds from my recent works. Viewing them in succession yields a quick sense of the direction of my research. Have a look! The central theme of my research is value in multiple forms. I follow Georg Simmel in characterizing value as only objectively measurable when it is manifest in exchange and view money as inherently social. Thus, I seek to understand how value is assessed and transferred in all forms of social and economic exchange, not just those involving money. The Problem. Traditional measures like GDP and PPP focus only on the monetized portion of human exchange and can provide an incomplete picture of human social and economic behavior at the macro scale. Uni-dimensional measures of household poverty at the micro level suffer from a similar shortcoming. I seek to redress these problems by studying the relationship between multiple forms of value in exchange, and by tracing their impact on contemporary concerns about deforestation, land use change, rural-urban migration, and household wellbeing in poor regions. I use data from long-term multi-method research projects in Thailand and the Brazilian Amazon to study specific facets of coupled human and natural systems, as well as to support comparative work. This quote appears in the syllabus for each class I teach, along with others. It is a provocative expression about the quest for excellence that I use to initiate a semester-long discussion about learning itself with students. Whether I am teaching statistics, data analysis, demography, social network analysis, or other subjects, my aim is never simply to teach the subject, but to show students how to learn about the subject. The latter serves as a basis for lifetime learning, and is by far the more critical skill in a rapidly shifting economic landscape than mastery of a subject alone. To this central pillar, I add a second: a focus on individualized student attention. The literature on the cognitive and social bases of effective learning is often contentious, but it does present a consistent account of diverse learning styles, motivations, and capacities in learners. It is essential to meet each student at her or his current level of understanding, and to integrate my instruction and guidance seamlessly with an existing set of experiences and knowledge, challenging worldviews at times, and working always to develop in each individual an effective strategy for life-long learning. Social Network Analysis provides many tools for clarifying the relational structure between all sorts of units of analysis. 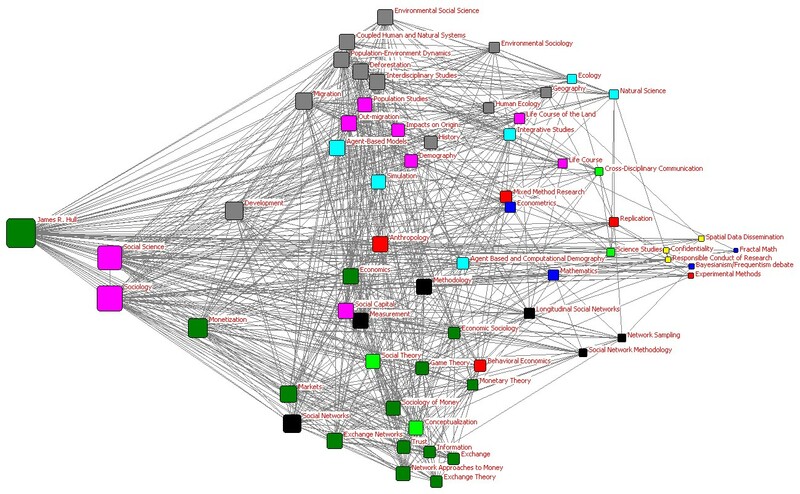 This is a visual representation of the connections I personally identify between the multiple subject areas and research traditions that I currently study or use. Using a principal components layout positions those topics and methodologies that are most integrated in my research at the beginning of 2011 closer to my name on the left.